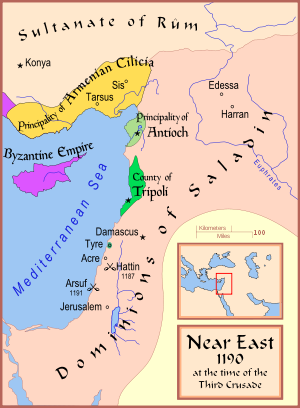 The Siege of Acre was the first confrontation of the Third Crusade, lasting from August 28, 1189 until July 12, 1191, and the first time in the history that the King of Jerusalem was compelled to personally see to the defence of the Holy Land. It was also the deadliest event of the whole period of the Crusades for the Christian ruling class of the east. King Guy was released from prison by Saladin in 1189. 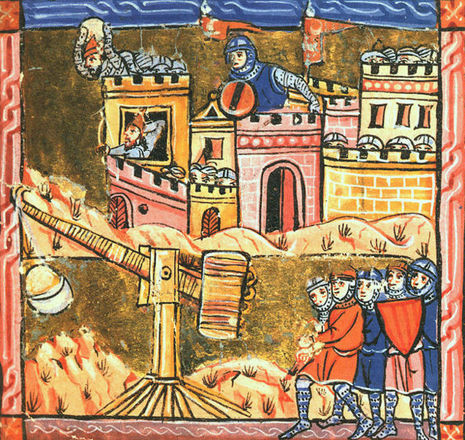 He attempted to take command of the Christian forces at Tyre, but Conrad of Montferrat held power there after his successful defence of the city from Muslim attacks. Guy turned his attention to the wealthy port of Acre. He amassed an army to besiege the city and received aid from Philip's newly-arrived French army. However, it was still not enough to counter Saladin's force, which besieged the besiegers. In summer 1190, in one of the numerous outbreaks of disease in the camp, Queen Sibylla and her young daughters died. Guy, although only king by right of marriage, endeavoured to retain his crown, although the rightful heir was Sibylla's half-sister Isabella. After a hastily arranged divorce from Humphrey IV of Toron, Isabella was married to Conrad of Montferrat, who claimed the kingship in her name.